While the Oneida and Western Railroad was never an actual operating railroad it was so interesting, not to mention colorful, that it is still talked about to this day. 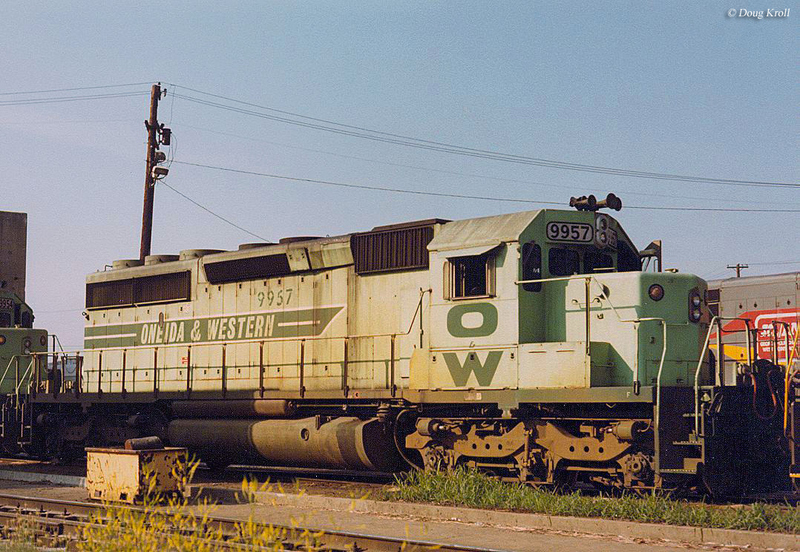 The O&W was created by its owner, the Shamrock Coal Company, in the 1970s which hoped to cut costs by owning their own railroad equipment and contract out rail movements to the Louisville & Nashville Railroad, a major southern Class I at the time (later Seaboard System). Interestingly, the O&W name did not come straight out of the blue but was a nod to a former Tennessee shortline that had been abandoned since the 1950s. 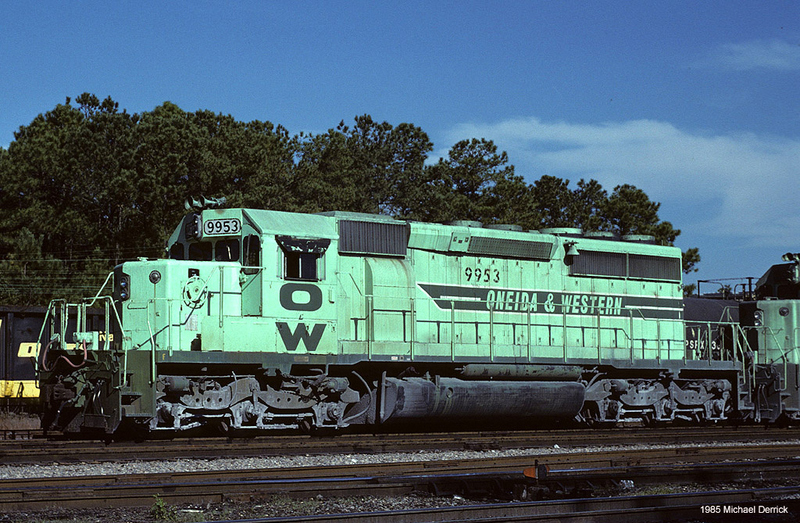 The idea behind the plan was to operate dedicated coal trains, a concept relatively new at that time, and Shamrock's two-tone mint green trains became legendary. Ultimately, cheaper freight rates in the late 1980s allowed a new owner to give up the practice. Today, much of the equipment is still in service although in use among several different owners. 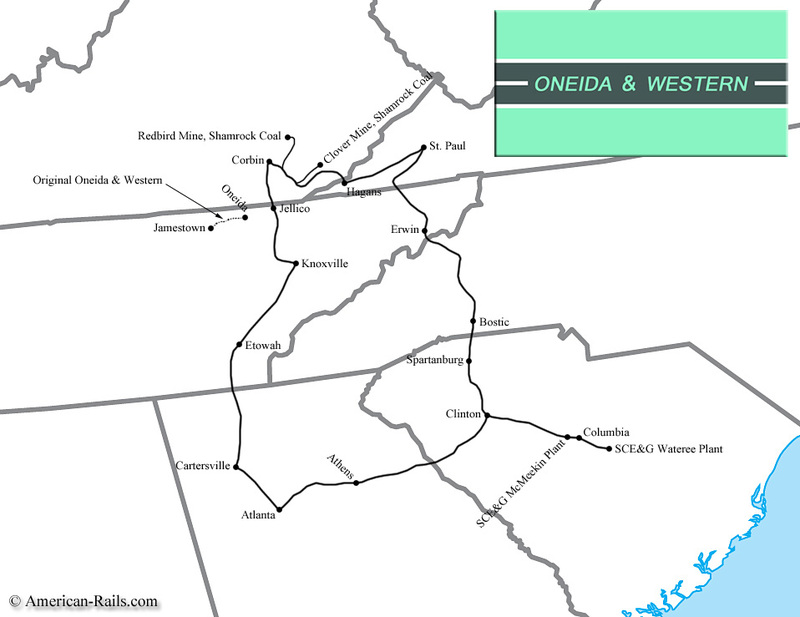 What led to the creation of the "Oneida and Western Railroad" began in the late 1970s. The energy crisis of that decade resulted in a rush on coal, which tended to follow the price of other fossil fuels like oil. The demand for coal, however, had also been going up since the late 1960s and the L&N specifically had been seeing an increase along its route during the early '70s as more power plants were being built in the south. The L&N's primary coal branches were located in southern Kentucky, western Virgina, and eastern Tennessee although the Bluegrass State had provided the railroad with the highly sought Btu, low sulfur, soft coal that provided an excellent profit margin. Unfortunately, the increasing demand for coal and the yearning by coal companies to move the product as quickly as possible to exploit the temporary high rates was wearing down the L&N's lines faster than it could keep them properly maintained. This caused branches and secondary routes to be literally run in the mud and to make matters worse the railroad was short on motive power and cars. In 1979 it was able to obtain a 22% rate increase after petitioning the Interstate Commerce Commission (ICC), much to the chagrin of mine owners. The Shamrock Coal Company, based in Knoxville, Tennessee owned several mines along the L&N (particularly in the Kentucky), and was growing tired of the delays not to mention that it was one of those opposed to the rate increases. However, the railroad was offering an interesting incentive; for coal companies which provided their own fleet of cars could obtain a rate reduction. Shamrock's president, B. Ray Thompson, pitched a plan to the L&N to cash in on the incentive; one of its major customers was South Carolina Electric & Gas and to keep it supplied with coal the company would provide two, 72-car dedicated trainsets, which even included cars and motive power! Needing the equipment anyway, L&N agreed to the idea with little hesitation. 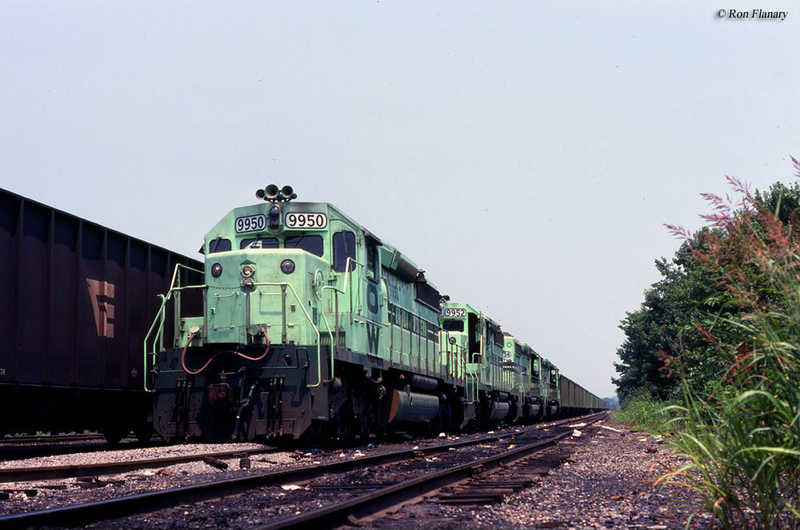 Shamrock ordered the 100-ton rotary-dump gondolas from Youngstown Steel in Ohio while Electro-Motive provided eight brand new SD40-2s (the most reliable and sought after locomotive model of its day) built to L&N specifications and numbered for its roster, 9050-9057. The two cabooses were constructed by International Car of Kenton, Ohio and built to Union Pacific's CA-11 model type. While the L&N was the operator, Shamrock still needed to designate the equipment as its own. So, president Thompson came up with the idea of using a long abandoned shortline as its name, the Oneida & Western (with reporting marks OWTX), whose trains he had watched as a child. This historic route dated back to its chartering in 1913 to connect Jamestown and Oneida, Tennessee and eight years later the route was open, 38 miles in all. It connected to the Southern Railway's famed "Rat Hole" line at Oneida and at one time carried a wide range of traffic from coal (predominantly) and lumber to some general merchandise and passenger trains. Traffic slowly dried up, particularly after World War II and the O&W was shutdown by the late summer of 1954 with rails pulled up in September. It was the colors Shamrock chose, however, that ultimately drew the most attention from railfans and the general public; a two-tone blend of mint green with the base a lighter color and a darker tone used for the lettering and trim. For a simple coal operation it was an incredibly attractive and creative paint scheme. The trains would come to operate two different routes; an easterly run from southeastern Kentucky, through western Virginia, and passing through eastern Tennessee and western North Carolina before reaching the SCE&G's plants at Columbia, South Carolina and another just east of the capital city. This trackage used the former Clinchfield and Seaboard Coast Line with some trackage rights via the Norfolk & Western; in all it was 508 miles in length. The western route was somewhat longer. It utilized the former Seaboard Air Line along with the L&N's own lines from Corbin, Kentucky running southward through Knoxville and Etowah, Tennessee and finally into Atlanta. From there it proceeded eastward to Clinton, South Carolina and finally on to the SCE&G's plants; in all 581 miles. The trains went into service in late 1979 and eventually came to exclusively use the western routing per Shamrock's request (the company wasn't exactly pleased with how the easterly connection was being operated). Daily services continued through the 1980s although during its final years O&W trains did not always operate dedicated. With the formation of CSX Transportation in 1987 and Shamrock's purchase by Sun Coal that same year O&W trains were on borrowed time. Under Sun, the company began shipping significantly more tonnage and instead of purchasing new equipment it simply went to CSX to negotiate a new contract which the Class I agreed to (this was now possible with the 1980 Staggers Act that deregulated the railroad industry). 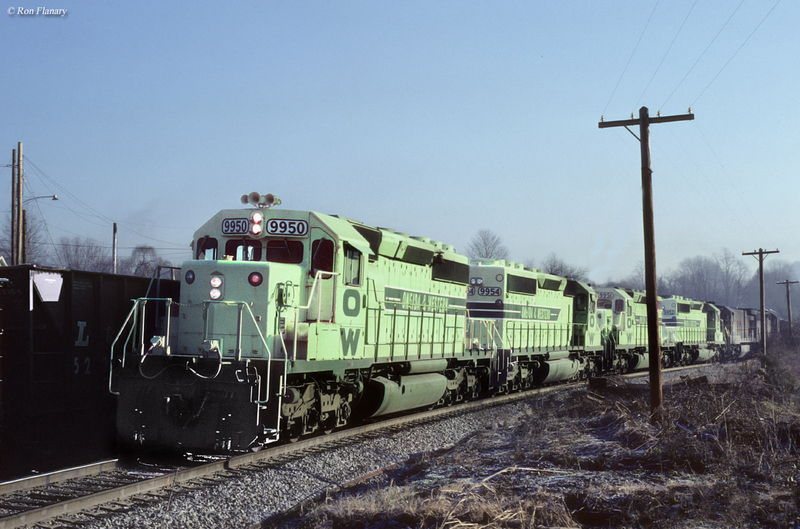 With the two O&W trains no longer needed the locomotives and cars were sold; BC Rail picked up the SD40-2s and Pacific Rail Leasing acquired the cars. Today, Thompson owns one of the cabooses while the other is fully restored in its O&W mint green and on display at the Southern Appalachia Railway Museum in Oak Ridge, Tennessee.